An MBA in 180 pages, Seeing the Big Picture simplifies the complexities of businesses large and small and shows you how a deep understanding of your company can help build the credibility and career you want. And it can make your work more fulfilling and purpose-driven by highlighting how you influence the success of your team, department, or organization. 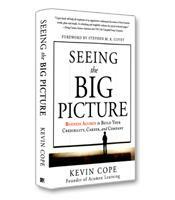 Just because people are in business doesn't mean that they get business, argues Kevin Cope, author of Seeing the Big Picture. Front-line or lower-level employees, especially — who do not have access to top-level deliberations on corporate strategy or rarely pay attention to the detailed financials of a business — may be working hard in a business without fully understanding how their work advances the success of that business or contributes to the financial foundation of the enterprise. Seeing the Big Picture is, in essence, Cope's tutorial in what he calls "business acumen," which he describes as the "keen, fundamental, street-smart insight into how your business operates and how it makes money and sustains profitable growth now and in the future." People with business acumen, he explains, are more likely to be chosen to move up a corporate ladder through jobs of increasing responsibility and importance to the company's success. According to Cope, business acumen requires understanding the five key drivers of a successful business: cash, profits, assets, growth and people. The first five chapters of Seeing the Big Picture explore each of the drivers in turn, with a sixth chapter explaining how the five relate to each other. In the second part of the book, Cope drills further down into the financial measures of a business, with one chapter helping readers to decipher financial statements and the annual report, and the remaining chapters covering the income statement, the balance sheet and the cash flow statement. Cope writes clearly and succinctly, a rare skill more likely to be found in books by journalists than consultants (Cope is president of his own consulting and training firm, Acumen Learning). Cope simplifies without being simplistic. The chapter on growth, for example, includes the now classic Amazon example of growth at all costs (literally), explains how growth can be measured on the top line or bottom line, covers the advantages and challenges of organic and inorganic growth, and shows how understanding the life cycle of a business can help create realistic expectations for growth. In the fictional case study that continues as a thread throughout the book, the owner of a bicycle shop ponders the advantages and disadvantages of opening a new store in a growing neighborhood or acquiring a competitor in a store near a college campus. The growth chapter also features two other ongoing elements of each chapter: an "AKA" box that clarifies terminology (in this case, the fact that "growth" usually refers to revenues but may refer to income or profit); and an "Insights" list at the end of the chapter that summarizes the chapter's takeaways. In his foreword, Stephen M. R. Covey eloquently explains who can benefit from Seeing the Big Picture. "If you're that business grad or entrepreneur who can't put your finger on why success seems to elude you," he writes, "or that functional expert with years of experience who's tired of being overlooked when your company presents new career opportunities ... or — like me — an executive who's looking for a quick reference field guide to help you focus your team on the simple fundamentals of business success, this book is for you." Seeing the Big Picture will allow employees or managers at all levels of a company to join any conversation about business without fear of swimming into the unknown. Even more important, their newly acquired "business acumen" can help them chart a path for career success and fulfillment.